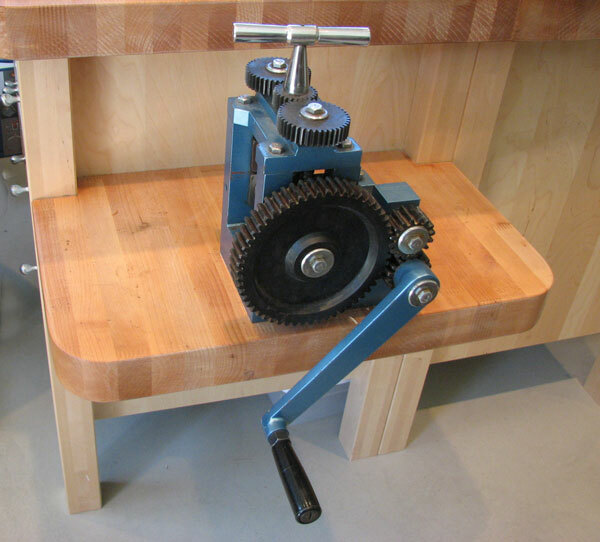 This little rolling mill has certainly rolled a lot of metal by students and me. It doesn’t have a fancy name, but it gets the job done. I am not sure if you can tell by the images but I have positioned the mill fairly low. I find it much easier to roll when I can get leverage up and over the mill. Rolling the mill is not easy when it is on a higher stand, unless you have much better upper body strength than me (not too hard to achieve). Always remember to use clean, annealed, dry sheet metal in your rolling mill. Never put anything other than non-ferrous (ferrous means iron) metal next to your rollers. In other words, no steel, no fabric no leafs, etc. These items and other non-ferrous object need a back plate (I typically use clean, scrap brass, 18-20g). The non-ferrous objects will be sandwiched between your metal being printed and the back plate. These items are fun to roller print: Laser cut cards (tip compliments of Deb Jemmott), dried tamale corn husks from the grocery store (from Judith Moore), egg shells (from Deb Jemmott). If you try the egg shells, make sure they are completely dry, the membrane has been removed, and you use backup plates.